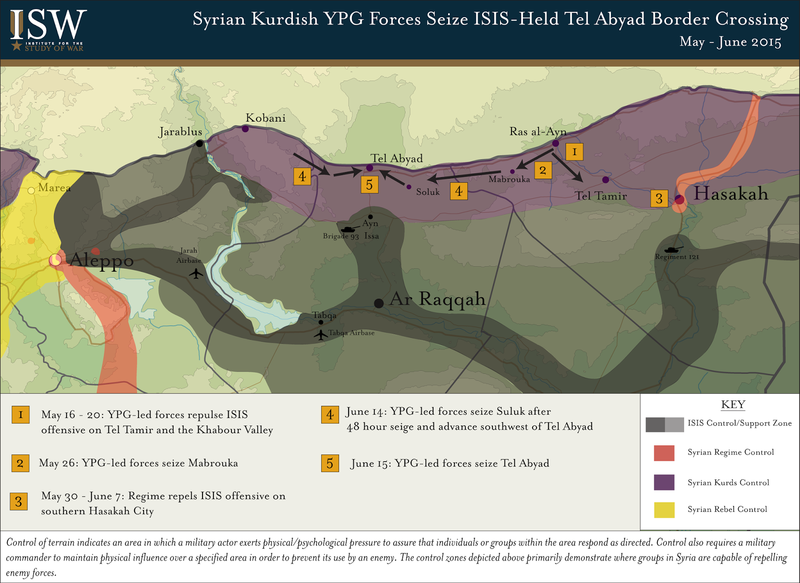 ISIS launched a series of spectacular counterattacks on June 24-25 in a two-pronged line of effort targeting Kurdish and regime forces in northern Syria. ISIS conducteda wave of suicide attacks in Hasaka City in northeastern Syria on June 24, detonatingtwo SVBIEDs as well as three or four SVESTs targeting Kurdish internal security and regime-held checkpoints in a move likely intended to soften the city’s defenses. ISIS later launchedan offensive against Hasaka City on June 25, detonating at least one VBIED and seizingthe regime-held southwestern neighborhoods of the city. 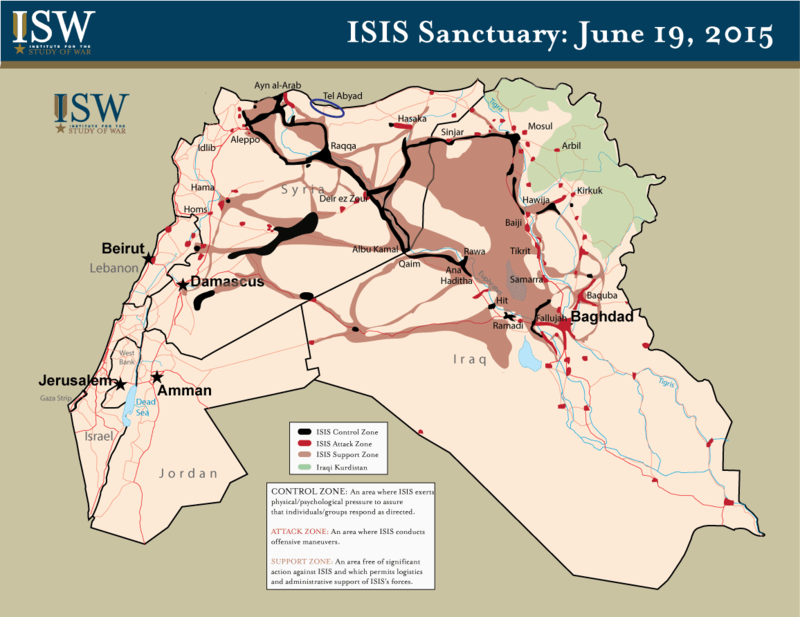 ISIS’s advance allegedly received supportfrom tribal fighters previously aligned with the Assad regime. Simultaneously, approximately thirty to forty ISIS fighters disguisedin Kurdish YPG and Free Syrian Army (FSA) rebel uniforms infiltratedthe Kurdish border town of Ayn al-Arab (Kobani) on June 25, detonating twoSVBIEDsat the border crossing to Turkey and clashing with YPG forces. 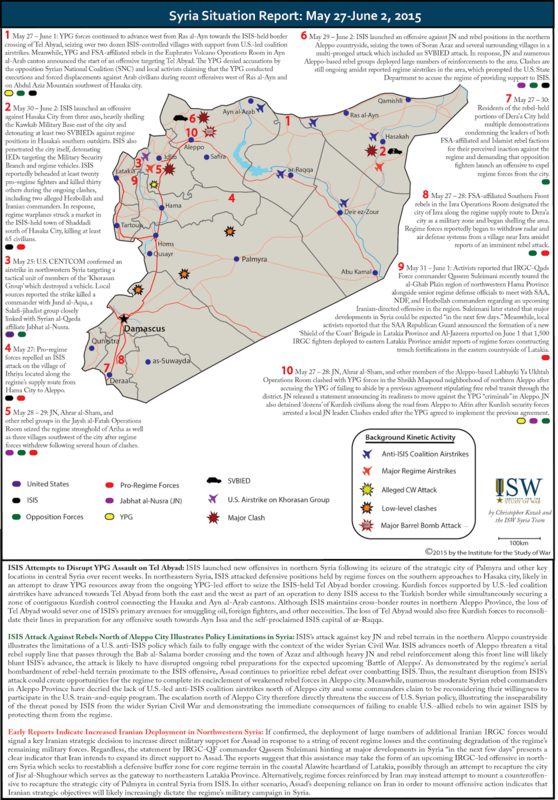 This analysis of the Syrian regime’s offensive campaign in Damascus and the nearby environs is adapted from the ISW report “An Army in All Corners”: Assad’s Campaign Strategy in Syria by ISW Syria Analyst Christopher Kozak published in April 2015. 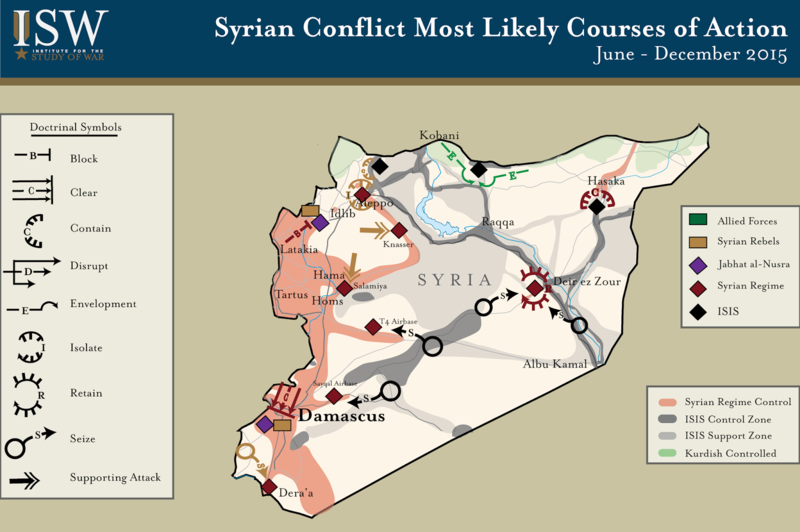 June 24th Update: As the Syrian Civil War moves into its fifth year, the Assad regime appears increasingly incapable of mounting successful large-scale offensive maneuvers capable of securing and holding territory amidst a string of recent ISIS, JN, and Syrian opposition advances. Unconfirmed reports over the past twenty-four hours indicate that Syrian rebels may now be preparing for a major offensive to seize Dera’a City in southern Syria in preparation for a potential drive on Damascus. The excerpt below details the regime’s military operations in Damascus and its environs through late 2014 and into 2015 in order to provide context regarding the military priorities and capabilities of the Assad regime in southern Syria. 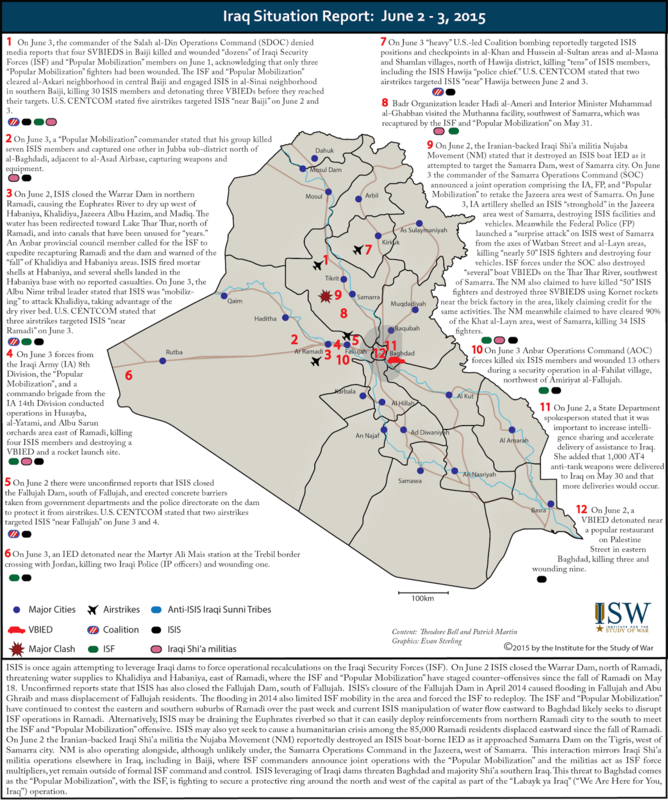 ISW will release a publication next week detailing recent developments in the south and their implications for the Syrian Civil War. Taken as a whole, Assad’s military campaign has largely succeeded only in generating further disorder. 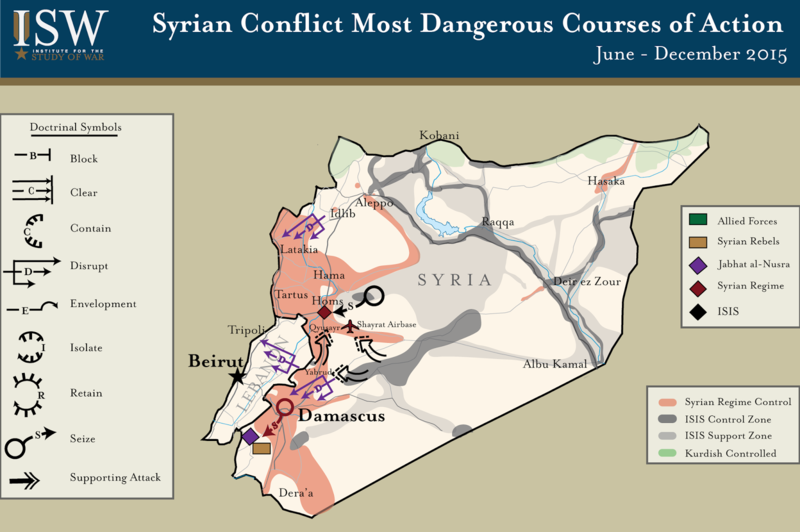 The strategy of defensive protraction adopted by the Assad regime resulted in a grueling and destructive stalemate across most of the battlefields of Syria through 2014 and into 2015. Limited manpower and resupply options constrained the offensive capabilities of pro-regime forces, forcing Assad to prioritize a small number of fronts while maintaining a reactive stance throughout the remainder of the country. This force posture has entrenched a state of persistent conflict in Syria which exacerbated humanitarian ailments, deepened polarization among the populace, and provided space for jihadist forces to expand their social and military control relatively unchecked. An increasing reliance on paramilitary and Iranian proxy forces along the most critical frontlines in Aleppo, Damascus, and the Alawite heartland failed to secure decisive victories against opposition forces and fueled sectarian narratives of conflict promulgated by extremist actors. An examination of the frontlines in Aleppo, Damascus, and central Syria where Assad chose to go on the offensive demonstrates how Assad balanced his available resources in order to achieve some battlefield success while preserving the ongoing stalemate across the country. One of the keys to Assad’s military strategy has been the campaign for Aleppo, a major commercial capital in northern Syria and Syria’s second-largest city. A continuous military presence in the city is essential to Assad’s claim to control all of Syria, though rebels have contested the city since 2012. Full control of Aleppo would strengthen the negotiating position of the regime in any future political settlement. It holds equal value to the opposition. The frontlines between regime and rebel forces within Aleppo city proper have remained relatively static for over two years as both sides lack the necessary manpower and equipment to clear and hold the dense urban terrain of the city. The regime decided to lay siege to rebel positions in the city in late 2013, shifting the relevant battlespace to the rural outskirts of the city where the regime’s superiority in armor and air assets could be maximized in support of offensive maneuver operations largely unseen in the rest of Syria. This ‘siege-and-starve’ strategy also followed the model of similar sieges by the regime throughout the country, most notably in Homs city and the suburbs of Damascus. The regime began the first phase of its encirclement campaign by seizing the heavily defended urban terrain of the Sheikh Najjar Industrial City northeast of Aleppo on July 5, 2014. The advance by the regime took advantage of advances made by ISIS north of Aleppo city which threatened rebel supply lines crossing into Turkey and spurred confusion among opposition ranks. Regime forces augmented by a range of pro-regime irregulars launched a second phase of advance and seized the villages of Handarat north of Aleppo city on October 3, 2014, in a direct threat to the only major rebel supply line into Aleppo city, the Castello Road. This same coalition of pro-regime forces entered the al-Mallah farmlands west of Handarat village on December 14, 2014. The growing delays between these advances, as well as an increasing reliance on Iranian proxy fighters staging through the Nayrab Airbase, suggested that the year-long operation to encircle Aleppo had come under increasing stress by late 2014. In a sign of the pressures placed upon pro-regime forces, the regime encirclement of Aleppo suffered its first significant setback in February 2015. On February 17, 2015, regime forces supported by fresh NDF, Hezbollah, and Shi’a Afghan reinforcements seized large portions of the villages of Bashkuy, Rityan, Duwayr al-Zeitun, and Hardatnin north of Aleppo following a rapid westward advance. The regime likely sought to break the siege of the Shi’a-majority towns of Nubl and Zahraa northwest of Aleppo, linking their forces in an arc of control dominating almost all opposition supply lines in the northern countryside of Aleppo. However, the scale and speed of the advance apparently overextended regime forces, leaving their positions vulnerable to rebel counterattack. Rebel forces recaptured the villages north of Aleppo within four days after clashes which killed over 150 pro-regime fighters. 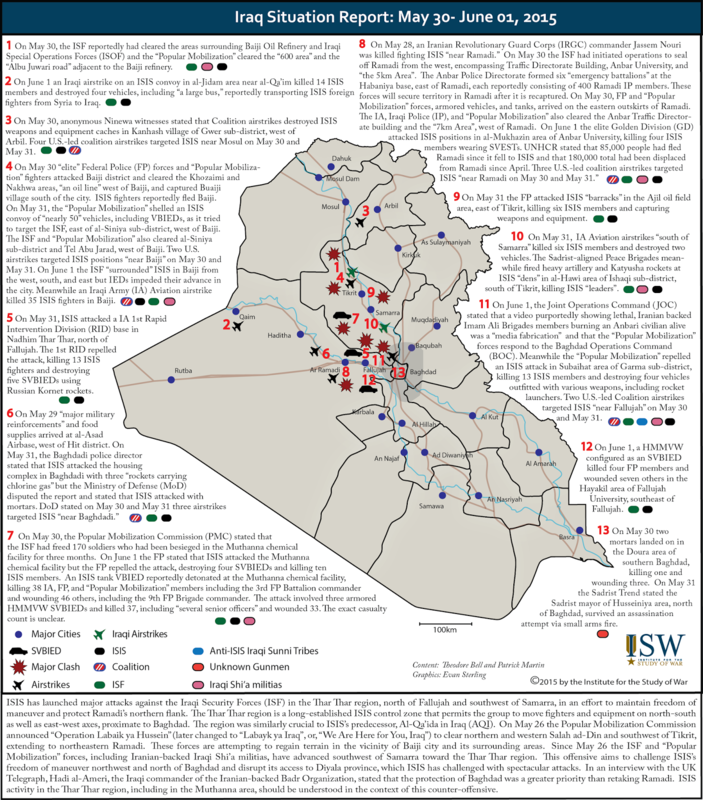 JN, Jabhat Ansar al-Din, and other allied Salafi-jihadist groups also captured the al-Mallah farmlands on February 20, 2015 and portions of Handarat village on March 10, reducing regime gains to the October 2014 status quo. This reversal demonstrated the difficulties that the regime faces in completing the encirclement of Aleppo while operating at the end of an extended supply line. However, despite these setbacks, regime forces still pose a dire threat to opposition-held Aleppo. Aleppo is a key northern “pin” on the map of Syria and Assad remains unlikely to abandon his campaign for any reason. The arrival of further regime reinforcements or an escalation of rebel infighting in Aleppo could enable the regime to complete the encirclement of the city. The end result of this operation would be a protracted siege of Aleppo which subjects the rebel-held districts of Syria’s commercial capital to starvation and punishing aerial bombardment in a powerful symbolic and strategic blow to the Syrian opposition. The elimination of the opposition threat to the Syrian capital of Damascus formed the second core component of the Assad regime’s military strategy. Durable control over the formal seat of government and the home of several million Syrian citizens provides the Syrian regime with a solid claim to domestic and international legitimacy. Damascus is also key terrain from a military perspective due to the high number of airbases, military installations, and elite SAA units present in the vicinity of the city. Damascus also serves as a key transit route for shipments of Iranian weapons and equipment to Lebanese Hezbollah and other proxy forces via the Damascus International Airport. 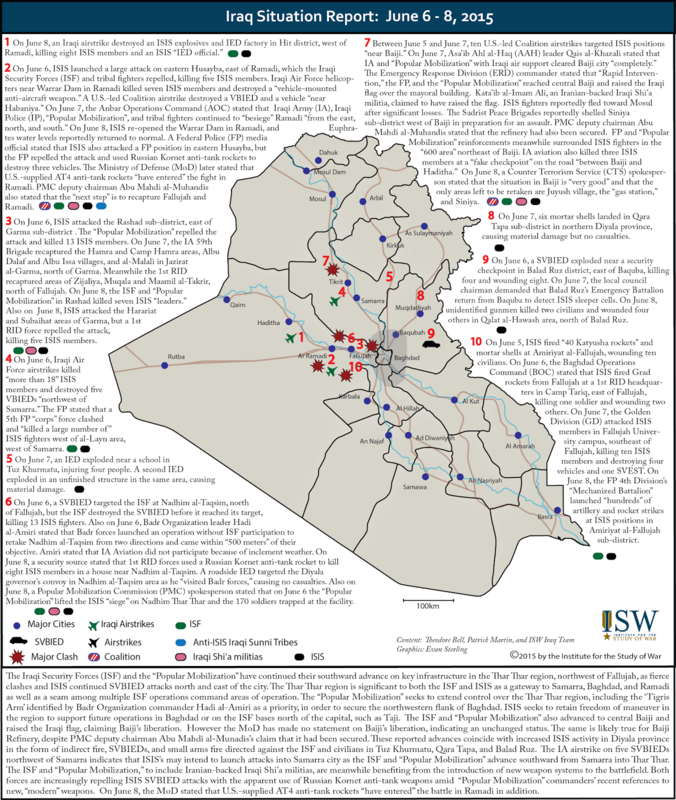 Rebel forces began actively contesting the capital in early 2012 and currently hold large swathes of the eastern and southern suburbs of the city. The regime’s campaign for Damascus can be broken into two distinct lines of effort. The first primary focus is the battle to reduce and eventually eliminate the strong rebel pocket in the Eastern Ghouta suburbs, a mixed rural-urban region which holds an estimated 160,000 civilians and opposition fighters.167 Eastern Ghouta has been the scene of some of the fiercest urban fighting in the capital, including the August 21, 2013 chemical weapons attacks targeting several opposition-held districts in the area. Meanwhile, the regime has also conducted a systematic effort to neutralize other opposition-held neighborhoods through sieges, starvation, and ceasefire agreements, preserving its combat power for other battlefronts. Assad has heavily relied upon his elite ‘praetorian guard’ units – including the Republican Guard and the 4th Armored Division – as well as Iranian proxy forces in order to prosecute his campaign in Damascus. Regime forces concentrated their offensive capacities against Eastern Ghouta in an attempt to neutralize and compress the largest pocket of opposition fighters in the capital. In contrast, the Assad regime utilized siege-and-starve tactics to neutralize rebel forces in the denser urban terrain of southern Damascus with minimal military effort. The regime directed its main efforts in early 2014 towards driving rebel forces from Jobar and Mleiha, two districts of eastern Damascus which formed part of the western defensive line for opposition-held Eastern Ghouta. Jobar represented the furthest line of opposition advance into Damascus city proper and its heavily-developed urban environment provided rebel forces with a decisive advantage which the assaulting forces of the elite SAA 105th Brigade Republican Guard were unable to overcome. Regime forces targeted Jobar with heavy artillery, airstrikes, and ballistic missiles on a daily basis, while both rebel and regime fighters have constructed complex networks of tunnels used to facilitate troop movement and ferry food and other supplies. In some cases, both sides have used ‘tunnel bomb’ attacks to burrow explosives underneath opposing strongholds. 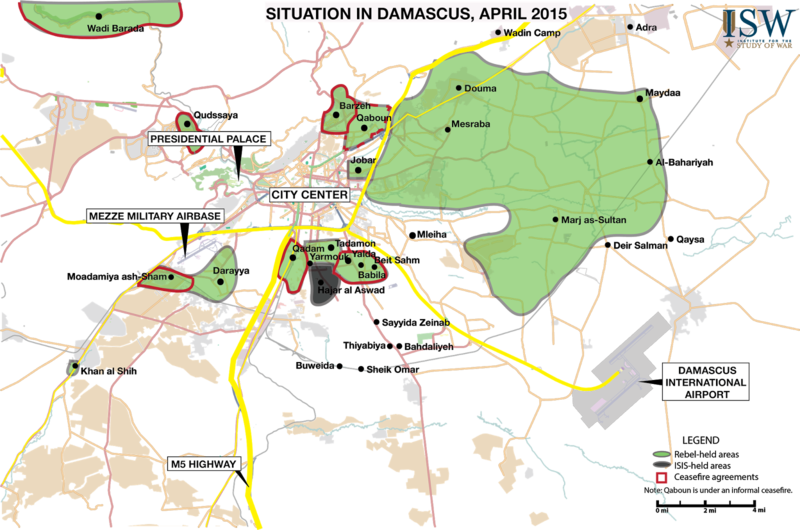 Under these conditions, the situation in Jobar remains a virtual stalemate as of April 2015. Forces from the elite SAA 4th Armored Division supported by NDF, Iraqi Shi’a fighters, and Hezbollah launched an offensive against Mleiha on April 3, 2014. Although the town was subjected to a constant barrage of airstrikes and ballistic missiles, regime ground troops proved unable to make significant initial gains. By the end of May 2014, pro-opposition media claimed that the clashes in Mleiha had killed over eight hundred pro-regime fighters. 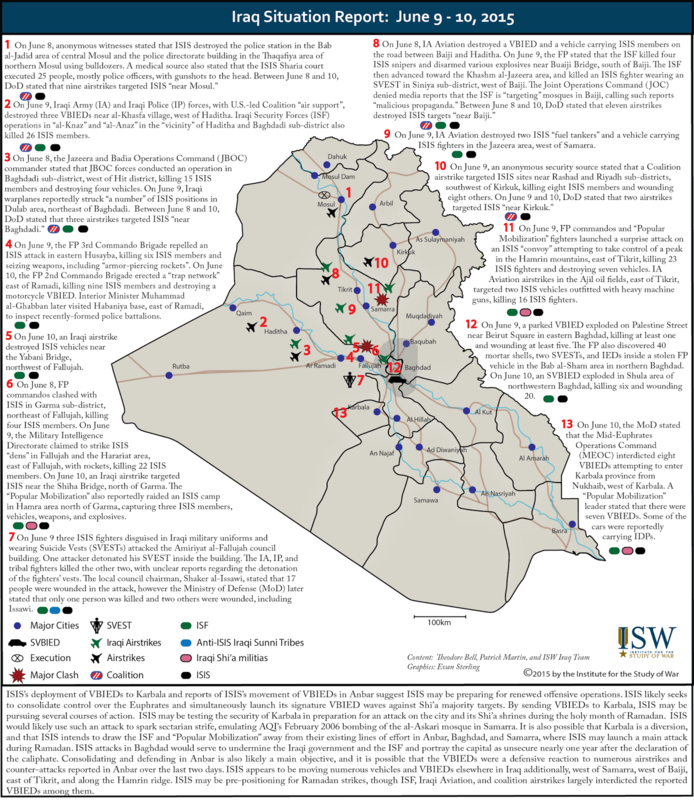 The withdrawal of Iraqi Shi’a militias from Syria following the fall of Mosul in June 2014 slowed the regime’s push for Mleiha. 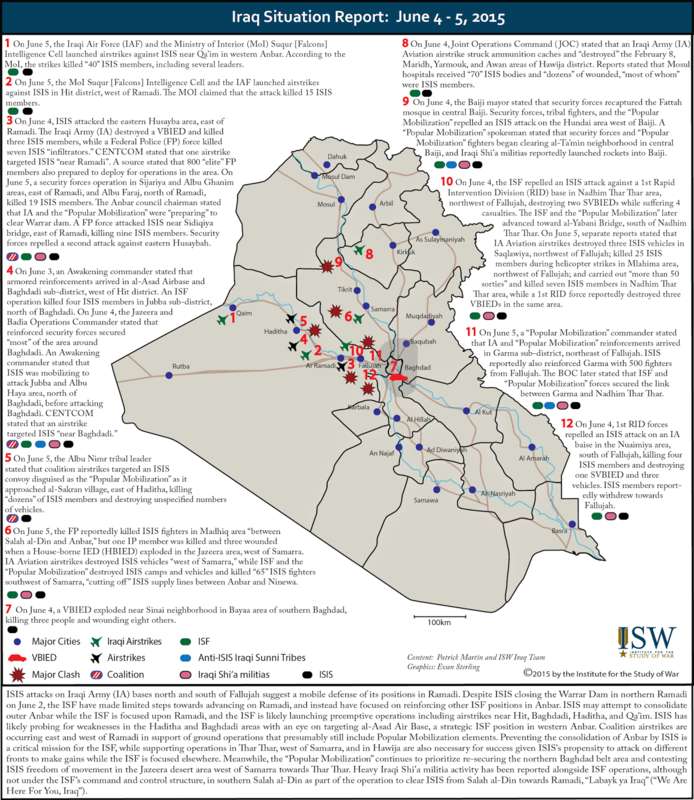 Activist sources reported that the majority of Iraqi fighters along the Mleiha front had departed by June 19, 2014, forcing the regime to ease its assault on the area. However, the mobilization and deployment of over 1,000 Hezbollah fighters to Damascus in order to “defend the Sayyida Zeinab shrine” quickly revitalized the regime’s offensive. On July 12, 2014, SAA supported by NDF and Hezbollah advanced around the eastern perimeter of Mleiha, placing the town and several hundred opposition fighters under siege. Although JN fighters used an SVBIED attack to successfully break the siege on August 3, 2014, pro-regime forces reestablished the cordon one week later. “The regime forces now wrap around the perimeter of the town,” the opposition Mleiha Local Council reported. Under siege and faced with punishing bombardment from the air, rebel fighters withdrew from Mleiha on August 14, 2014 in a major victory for regime and Hezbollah forces. An activist asserted that “the loss of Mleiha is considered as important as the loss of the Qalamoun” region along the Lebanese border to a similar joint regime-Hezbollah operation in early 2014. Regime forces capitalized on momentum gained from the capture of Mleiha as well as the arrival of reinforcements drawn from the nearby Qalamoun region to secure several additional victories against the Syrian opposition in Eastern Ghouta. SAA and NDF forces seized the village of Adra and the adjacent Adra Industrial City after a series of clashes from September 25 to 27, 2014, restricting rebel freedom of movement towards the Qalamoun region to the northeast. Meanwhile, Republican Guard units and rebel forces traded possession of the Dukhaniyah suburb located northwest of Mleiha multiple times in September 2014 in heavy clashes which included several alleged chlorine gas attacks before regime fighters finally secured the district on October 6, 2014. The Assad regime next turned its attention towards the town of Douma, a major rebel stronghold in the Eastern Ghouta suburbs dominated by prominent Islamist faction Jaysh al- Islam. On November 6, 2014, SAA forces seized the Wafidin Camp north of Douma, severing the last remaining opposition supply line into Eastern Ghouta. Over subsequent months, the Syrian Air Force sharply intensified its bombardment of Douma and other towns in Eastern Ghouta, causing hundreds of casualties. Mosques in Eastern Ghouta began cancelling Friday prayers in order to avoid presenting tempting targets to regime pilots. The severity of these airstrikes prompted Jaysh al-Islam to announce a retaliatory campaign of rocket attacks targeting Damascus city in late January to early February 2015 in a move publically portrayed as an attempt to deter further regime bombardment. The Assad regime leveraged illegal tactics of collective punishment in order to encourage the depopulation of rebel-held areas. On November 24, 2014, regime forces opened the Wafidin Camp crossing to permit “dozens” of families to flee Eastern Ghouta. 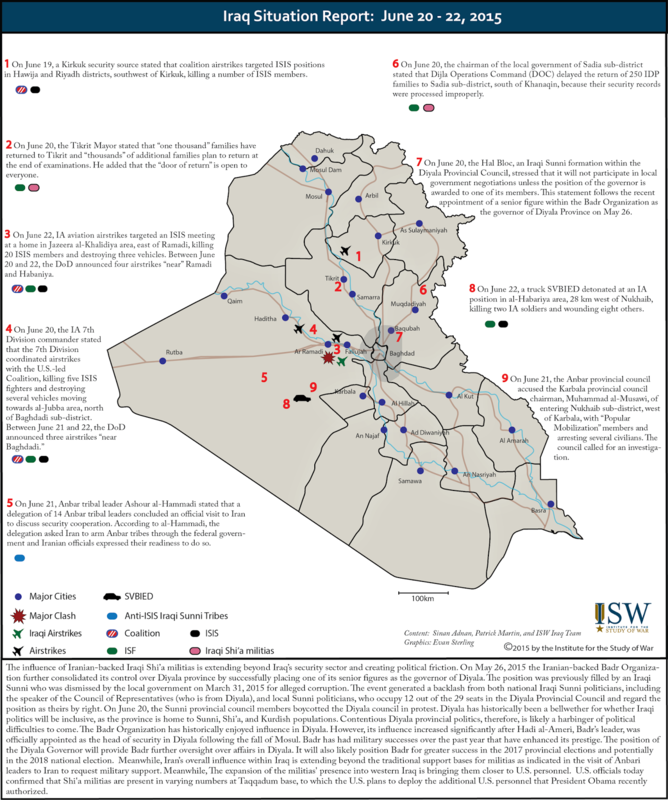 In late January 2015, Syrian state media claimed regime forces evacuated over 2,000 additional civilians from the area. On March 19, 2015, opposition sources reported that another 1,000 civilians were allowed to flee Eastern Ghouta via a checkpoint in Harasta. These mass evacuations served a clear propaganda purpose by highlighting the cleavages between rebel forces and the populace under their control. The policy of evacuations also fuels suspicions and infighting amongst rebel forces in Eastern Ghouta regarding potential reconciliation agreements with the regime. Overall, however, the regime campaign against Eastern Ghouta appears to have stalled amidst a shift in regime focus towards countering rebel gains in Dera’a and Quneitra Provinces to the south. The Assad regime has relied on a system of sieges to force the submission of opposition-held neighborhoods throughout Damascus without diverting valuable combat resources from Eastern Ghouta. Regime forces also employ these blockades to depopulate rebel-held terrain, draining the pool of opposition support while bolstering the legitimacy of the Syrian government. One internal UN World Food Program document implicitly acknowledging that civilians can only receive food if they relocate to regime-held areas. The widespread use of deliberate starvation as a tool of war prompted the UN Security Council to pass UNSC Resolution 2139 on February 22, 2014, underscoring that “starvation of civilians as a method of combat is prohibited by international humanitarian law” and demanding that “all parties, in particular the Syrian authorities, promptly allow rapid, safe and unhindered humanitarian access” to all areas of Syria. Despite this rebuke, the Assad regime has continued its siege-and-starve campaign in southern Damascus unabated through 2014 and into 2015, particularly in the southwestern suburb of Darayya and the Yarmouk Camp district of Damascus. The examination of one prominent Damascus ceasefire deal provides a reflection of these tensions. The southwestern Damascus suburb of Moadamiyah concluded a local ceasefire agreement with regime forces in December 2013 after a punishing siege. The ceasefire was promoted as a sign of ongoing “national reconciliation;” however, the Assad regime delayed in meeting its obligations and only partially lifted its siege. Reflecting upon the ceasefire agreement over a year later in February 2015, an activist from Moadamiyah wrote in the Washington Times: “The regime continues to cut off power, gas and other basic services to Moadamiyah. Some humanitarian aid is allowed to enter, but not nearly enough for the town’s residents…Most egregiously, bombardments continue and the regime has resumed arrest raids on civilians.” Read the full report for accounts of a similar ceasefire agreement in the southern Damascus neighborhoods of Yalda, Babbila, and Beit Sahem in February 2014. The Assad regime sought to clear and hold the Qalamoun Mountains, a strategic region northeast of the capital running along the Lebanese border, in order to defend the northern approaches to the capital and maintain access to the M5 Highway connecting Damascus to Homs, Hama, and the Syrian coast. The establishment of a strong regime presence along the border region also served to sever cross-border rebel supply lines based out of eastern Lebanon. Thus, regime forces launched a major operation to clear the Qalamoun on November 15, 2013. The timing of this offensive coincided with the end of major regime combat operations to clear the supply line to Aleppo city in an indication of the military advantage enjoyed by the Assad regime in late 2013. Lebanese Hezbollah fighters played a key role in the offensive, providing strained and inadequately equipped regime units with large amounts of manpower skilled in mountain warfare. Regime forces supported by Hezbollah and the NDF rapidly advanced south along the M5 Highway towards Damascus, seizing a string of rebel-held towns including Deir Attiyah in late November 2013, an-Nabek in mid-December 2013, and the opposition stronghold of Yabroud on March 16, 2014. 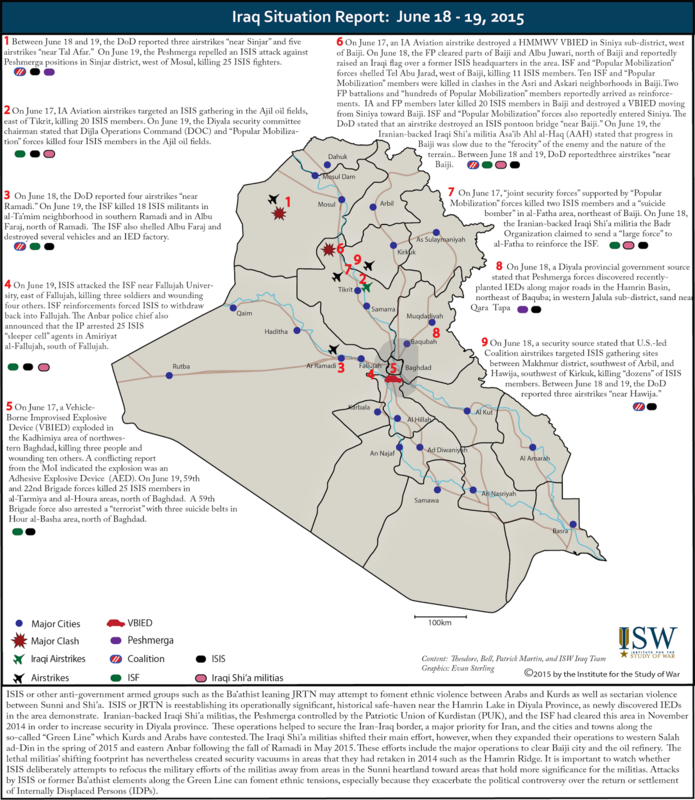 (Read “The Fall of Yabroud and the Campaign for the Lebanese Border” by ISW Analyst Isabel Nassief.) As thousands of rebel fighters fled into Lebanon or further southwest towards Damascus, the regime offensive continued to move along the Lebanese border. Rebel and Hezbollah sources indicated that Hezbollah fighters led most of the ground offensives in the Qalamoun while the SAA restricted itself to providing air and artillery support. This deep reliance on foreign proxy forces to achieve battlefield success illustrated the declining agency of the Assad regime on the battlefield. Regime and Hezbollah forces proved unable to clear rebel presence from the rural regions of the border despite holding most urban centers in the Qalamoun and maintaining unrestricted use of the M5 Highway. One Hezbollah fighter noted in an interview the difficulties in securing the rugged terrain of the region, stating that “It’s impossible for us to control all the mountains along the border, but we have enough people to do reconnaissance and ambushes.” These limitations forced Hezbollah and regime forces to man static defensive positions in unfriendly terrain, leaving their fighters vulnerable to attack. 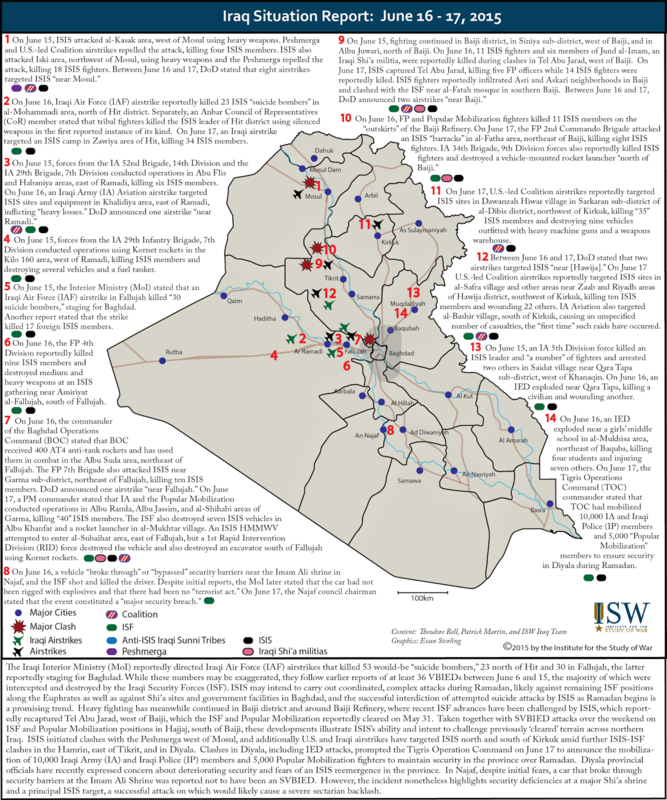 Rebel forces exploited the disruption caused by the withdrawal of Iraqi Shi’a militiamen from Syria in mid-June 2014 to launch a wave of deadly raids against Hezbollah and NDF checkpoints located on the outskirts of Rankous, Asal al-Ward, Hawsh al-Arab, Ras Ma’ara, Deir Attiyah, and Yabroud. Meanwhile, Hezbollah and NDF fighters continued to bear an increasing share of the combat burden in the northern Qalamoun as the Syrian regime redeployed its regular SAA units in the area to reinforce frontlines in Damascus city and Zabadani in the southern Qalamoun. This pressure sparked open clashes on several instances between Hezbollah fighters and local NDF militiamen rooted in accusations that Syrian forces rarely participate in fighting, leaving their Hezbollah partners unsupported. Primary regime efforts in Qalamoun shifted in the summer of 2014 to the town of Zabadani located northwest of Damascus near the Jdaydet Yabous border crossing, a primary supply route used by Lebanese Hezbollah to transport fighters and weapons between Syria and Lebanon. The Assad regime first focused on isolating Zabadani from rebel reinforcement and resupply. Regime forces established a cordon around Zabadani and subjected the town to heavy shelling with artillery and barrel bombs throughout the summer and fall of 2014. However, in late December 2014 Ahrar al-Sham, JN, and other opposition forces launched an offensive which seized several checkpoints and military installations northwest of Zabadani, loosening the regime siege over the area and threatening Jdaydet Yabous. Clashes to reassert the cordon around Zabadani are still ongoing as of April 2015 with regime forces unable to secure a decisive advantage. Dera’a and Quneitra Provinces in southern Syria formed a major source of opposition strength which directly threatened the southern approaches to Damascus. 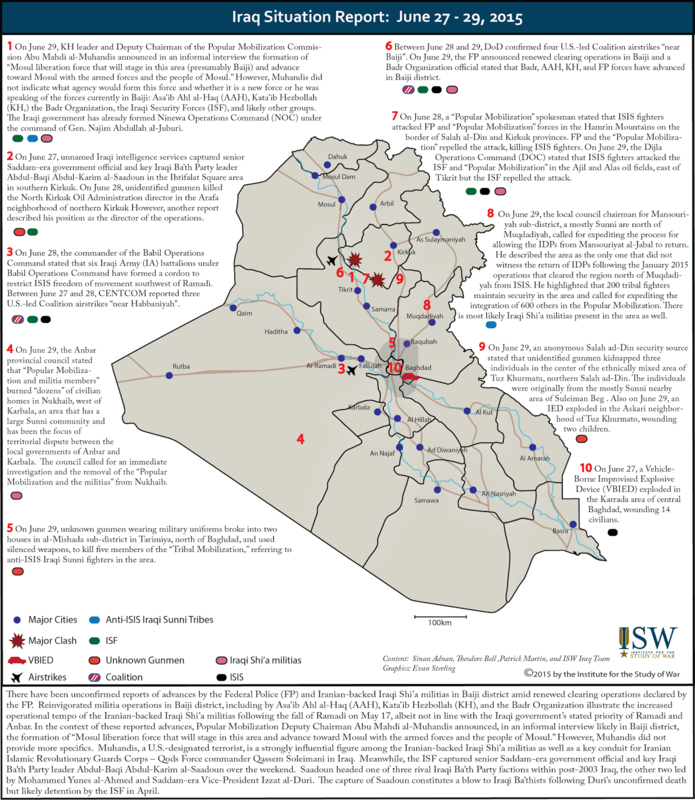 Nonetheless, regime forces in the two provinces operated in a relatively passive defensive stance throughout 2014, appearing content to slowly trade territory in the heavily-militarized region in order to devote limited reinforcements to other fronts. SAA units based in Dera’a and Quneitra Provinces were rarely reinforced, while pervasive anti-regime sentiment among the local population resulted in low NDF recruitment. Most SAA formations in southern Syria remained in close vicinity to their bases despite the spread of the Syrian civil war due to both pragmatic concerns over the political reliability of conscript soldiers as well as strategic concerns regarding the fears of an Israeli incursion. The Assad regime also likely remained confident that opposition forces could not breach the Damascus ‘military zone,’ a belt of strongpoints and army facilities south of the city originally designed to shield the capital against an Israeli armored thrust from the Golan Heights. 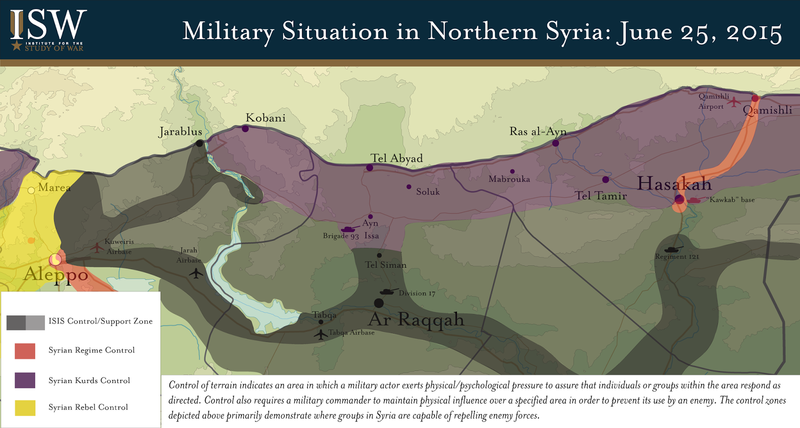 Increasing rebel unification and a series of successful opposition offensives in summer and fall 2014 increasingly challenged the regime disposition in southern Syria. Rebel fighters had seized a series of hills and military facilities in southern Quneitra Province by May of 2014, enabling opposition forces to form a continuous zone of control along the Jordanian border. Rebel momentum continued unabated, despite asymmetric response by the Syrian regime including large numbers of barrel bomb attacks, air raids, and heavy artillery shelling. JN, Ahrar al-Sham, and the FSA-affiliated Southern Front seized the Quneitra border crossing with the Golan Heights on August 28, 2014, as well as Tel al-Hara, the location of a joint Russian-Syrian signals intelligence facility on October 5, 2014. JN and other rebel forces later seized complete control over the town of Sheikh Miskin on January 25, 2015 despite the reinforcement of regime units by Hezbollah fighters and IRGC officers, threatening the regime’s supply line to isolated forces in Dera’a city. This rapid succession of rebel gains threatened to bring Syrian opposition forces to the southern gates of Damascus city, forcing the regime to re-evaluate its strategy. Regime forces responded by launching an offensive against rebel positions in northwestern Dera’a Province on February 9, 2015 with support from at least forty tanks of the elite 4th Armored Division. Iran reportedly played a key role in the planning, organization, and execution of the offensive, with activists claiming that a large proportion of involved ground forces were composed of fighters from Lebanese Hezbollah, Liwa Abu al-Fadl al-Abbas, and the ‘Fatimiyoun’ Iranian-Afghani Shi’a militia. Multiple sources claimed that overall leadership for the operation was provided by ‘Iranian commanders’ with Syrian officers being transferred away from the front or executed for alleged collaboration with rebel forces. In support of this claim, IRGC Quds Force commander Qassem Suleimani reportedly made a public appearance along the frontlines on February 11, 2015. In another notable indicator, this offensive followed the aforementioned Israeli airstrike in the al-Amal Farms area of Quneitra Province on January 18, 2015 which killed several prominent Hezbollah commanders, including Jihad Mughniyeh, as well as IRGC ground forces commander General Mohammad Ali Allahdadi. This delegation of senior Hezbollah and IRGC figures was likely conducting final preparations for the upcoming offensive. The degree of Iranian leadership and coordination witnessed in this offensive was unprecedented and signalled a willingness by Iran to adopt a more overt posture in Syria in order to protect its interests in the country. Within days, the pro-regime coalition made significant gains – seizing the rebel-held towns of Deir al-Adas, Deir Makir, and al-Danajah in northwestern Dera’a Province while threatening the towns of Kafr Nasij, Kafr Shams, and Masharah. Rebel commanders stated that pro-regime forces employed a number of unfamiliar tactics which initially overwhelmed opposition units once again underscoring the notion that Iran and its proxy forces took lead over the SAA and regime military commanders in this offensive. The trajectory of pro-regime forces indicated that they likely intended to recapture the strategic heights at Tel al-Hara, reestablishing dominance over a large swath of the Dera’a Plain. However, despite declarations by opposition defense minister Maj. Gen. Salim Idriss that “the balance of power is in favor of the Iranian militias” in southern Syria, regime advances slowed in the face of several counteroffensives and the arrival of large numbers of rebel reinforcements to the area. Opposition groups continued to gain ground against the regime in other parts of the province despite being placed on the defensive in northwestern Dera’a Province. Rebel forces seized the town of Busra al-Sham along the border with Suwayda Province on March 25, 2015 and the Nasib border crossing with Jordan six days later. These victories underscore the limitations of Assad’s military forces even when augmented by Iranian proxies and advisors. Key Takeaway: YPG forces supported by FSA-affiliated rebel forces and U.S.-led coalition airstrikes seized the ISIS-held border crossing of Tel Abyad in northern ar-Raqqa Province on June 15, 2015, in a major victory for Syrian Kurds and the international anti-ISIS coalition. These gains successfully connect the Kurdish cantons of Kobani and Hasakah into one contiguous zone of YPG control along the Turkish border and optimally positioned joint YPG-FSA forces for an eventual advance south towards the ISIS stronghold of ar-Raqqa City. 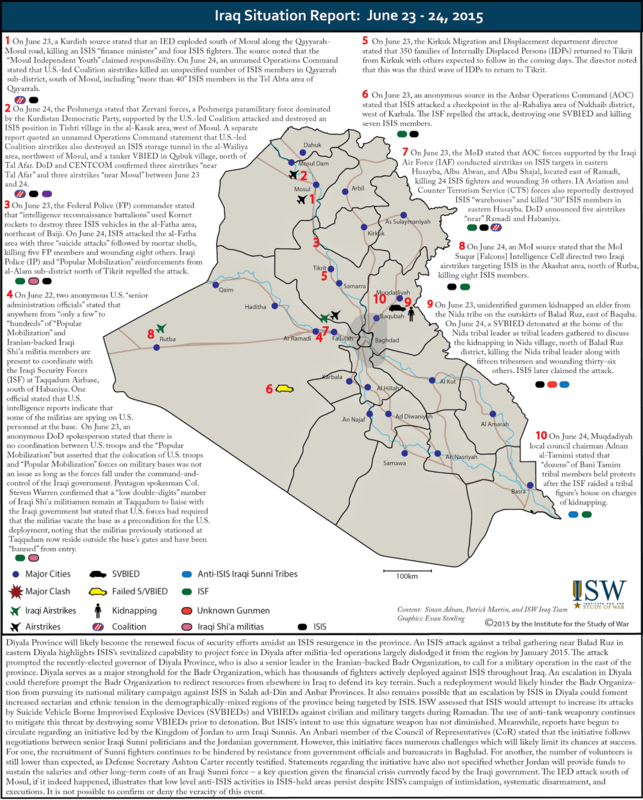 Kurdish forces cooperated with a coalition of Arab tribes, Assyrian paramilitary forces, and FSA-affiliated rebel factions to enable its rapid advance, although sustained accusations of ‘ethnic cleansing’ by the YPG of Arab civilians may disrupt wider coordination with the Syrian opposition. Recent YPG gains will also likely exacerbate tensions between Syrian Kurds, the Turkish government, and the Assad regime in a way which limits the options available to both the YPG and the U.S. in the fight against ISIS in northern and eastern Syria. Syrian Kurdish YPG forces supported by FSA-affiliated rebel forces and U.S.-led international coalition airstrikes seized the ISIS-held border town of Tel Abyad in northern ar-Raqqa Province on June 15, 2015. This victory marks the culmination of a new YPG-led campaign to reverse ISIS’s gains against the three Kurdish cantons of northern Syria, including Hasakah, Kobani, and Afrin; to limit the flow of direct ISIS reinforcement through the Tel Abyad border crossing to ar-Raqqa City and eastern Syria; and to establish a contiguous Kurdish region stretching from Kobani to Hasakah Province. Tel Abyad is a border town on the Syrian-Turkish border between two Kurdish areas, Hasakah and Kobani that lies immediately north of ISIS-held Raqqa city. Tel Abyad and its surrounding villages represented a pocket of ISIS-held terrain which blocked transit between the Hasakah and Kobani cantons and simultaneously provided ISIS with direct supply lines for reinforcement and resupply between the Turkish border and the self-declared ISIS capital city of ar-Raqqa. 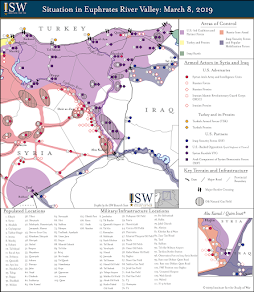 Although ISIS steadily lost ground to joint Kurdish and rebel forces in eastern Aleppo Province in the immediate aftermath of the failure of its Kobani offensive in March 2015, ISIS forces managed to establish relatively stable defensive lines to protect Tel Abyad from the west. ISIS even achieved limited gains in Hasakah Province to the east, where Kurdish and regime forces maintain an informal alliance to cooperate in securing the province against ISIS advances. The new YPG operation, announced on May 6 under the name Operation Martyr Rubar Qamishlo after a fallen YPG commander who died fighting ISIS, sought to reverse this dynamic and roll back the remaining ISIS presence in northern Syria. The operation began in Hasakah Province with a YPG push south from the Turkish border crossing at Ras al-Ayn east of Tel Abyad, directed tosecure numerous villages recently threatened by ISIS, including the crossroads town of Tel Tamir, the Assyrian villages of the Khabour River Valley, and the entirety of the Abdul Aziz mountain range west of Hasakah City. The YPG conducted this phase of the operation with the assistance of local Assyrian militia formations. Once the YPG had secured the western flank of Hasakah Province, YPG forces began the advance west towards Tel Abyad and seized the town of Mabrouka southwest of Ras al-Ayn on May 26 after receiving a “green light” from the U.S.-led air coalition to seize the entirely of the Kobani – Hasakah road along the Turkish border. This decision signaled U.S. support for some form of contiguous Kurdish autonomous region in northern Syria despite continuing Turkish reservations regarding the expansion of YPG influence on its southern border. In response, ISIS launched an offensive against regime positions south of Hasakah City on May 30 in an apparent attempt to divert Kurdish resources and disrupt the ongoing YPG offensive. However, ISIS’s effort failed to draw significant numbers of Kurdish fighters towards Hasakah City, and YPG forces supported by FSA-affiliated rebels subsequently seized dozens of villages west and east of Tel Abyad in a consolidated effort to envelope the border city. These advances culminated in the seizure of the town of Suluk 20 kilometers southeast of Tel Abyad on June 14. The next day, YPG and FSA forces penetrated Tel Abyad from the southeast and quickly overwhelmed the small, unreinforced ISIS force that remained in the town, prompting them to surrender to Turkish forces at the border or flee south towards Ayn Issa and ar-Raqqa City. YPG and rebel commanders have since messaged that the next phase of anti-ISIS operations will involve a joint YPG-FSA offensive south from Tel Abyad to seize Ayn Issa, sever interior ISIS lines of communication, and threaten ar-Raqqa City. 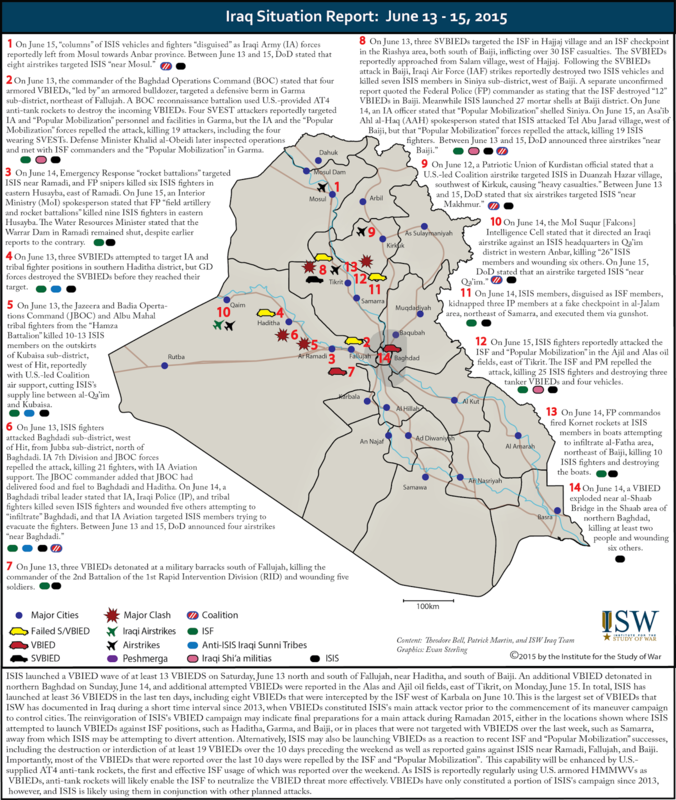 This operation could potentially enable anti-ISIS forces to penetrate into ISIS’s core stronghold in Syria in a development which may produce positive ramifications for other anti-ISIS operations across Iraq and Syria. The YPG leveraged a coalition of allied forces in order to buttress its offensives in northern Syria and promote its inclusiveness to non-Kurdish populations in the region. In Hasakah Province to the east, YPG forces resisting ISIS’s advances in Tel Tamir and the majority-Assyrian villages along the Khabour River Valley received assistance from a number of Assyrian paramilitary formations, including local residents enrolled in the ‘Khabour Guards’ as well as fighters from the greater Syriac Military Council (MFS). YPG units in Hasakah Province also cooperated closely with Jaysh al-Sanadid, an Arab tribal militia commanded by Sheikh Hamidi Daham al-Hadi of the historically pro-Kurdish Shammar tribe of northeastern Syria and northwestern Iraq. Although these groups remain driven largely by local concerns and have not played noticeable roles in the YPG offensive on Tel Abyad, their presence enables the YPG to deploy manpower towards offensive action without compromising security in its rear areas. In Kobani canton to the west of Tel Abyad, the YPG operates alongside a number of FSA-aligned Syrian rebel factions organized under the umbrella of the Burkan al-Firat (Euphrates Volcano) Operations Room. The Euphrates Volcano Operations Room was founded on September 10, 2014, with the expressed intent of expelling ISIS from eastern Aleppo and ar-Raqqa Provinces. The majority of the groups participating in the operations room consist of local brigades seeking to reclaim their home regions following losses to ISIS which forced them to seek shelter in Kurdish-held areas. The presence of these rebel fighters thus provides YPG forces with added legitimacy in their efforts to seize and administer Tel Abyad and the surrounding villages of northern ar-Raqqa Province, which are populated primarily by Arab and Turkmen civilians sympathetic to ISIS. Despite its inclusion of FSA-affiliated rebel factions and other local paramilitary forces, prominent opposition actors have accused YPG forces of perpetrating a number of abuses against Arab civilians during the advance into northern ar-Raqqa Province. These allegations largely center upon claimed YPG involvement in the forced displacement of Arab civilians and the burning of Arab homes in an “ethnic cleansing” campaign designed to lay the foundation for the establishment of an autonomous Kurdish region in northern Syria. On May 30, as YPG forces began the advance towards Tel Abyad, the exiled Syrian National Coalition (SNC) released a statement accusing the YPG of committing “violations” against the local civilian population in Hasakah Province which served to “encourage sectarian and ethnic extremism.” In early June, Syrian opposition figures reaffirmed their concern over reports of YPG civilian abuses against Arab and Turkmen populations in light of the imminent fall of Tel Abyad. Former Syrian Military Council (SMC) chief of staff Salim Idriss stated his concern regarding Kurdish abuses against civilians, while Ahrar al-Sham, Jaysh al-Islam, and thirteen other prominent rebel brigades released a joint statement demanding that the YPG be listed as a “terrorist organization” due to its “ethnic cleansing” of Arab areas. Independent media organizations have also reported these allegations, although no clear evidence has yet been presented. These accusations may threaten to disrupt the current cooperation between Kurdish forces and the Syrian opposition amidst preparations for a FSA-led offensive towards ar-Raqqa City. The YPG capture of Tel Abyad marks a major strategic victory for Kurdish forces and their efforts to form the governance structures of a self-declared Kurdish autonomous region in northern Syria termed ‘Rojava.’ Kurdish control over Tel Abyad and its countryside provided a physical link between the Cizire (Hasakah) and Kobani (Ayn al-Arab) cantons for the first time, bolstering the YPG’s value to the international anti-ISIS coalition as well as Kurdish claims to self-governance. However, these gains also escalate tensions with two prominent actors: Turkey and the Assad regime. The Turkish government has repeatedly condemned the YPG as a “terrorist” group due to its connections with the outlawed Kurdistan Workers’ Party (PKK), and Turkish President Recep Erdogan warned on June 14 that the YPG seizure of Tel Abyad “could lead to the creation of a structure [i.e. Rojava] that threatens our borders”. These concerns could ultimately drive the Turkish government to curtail or otherwise limit its participation in the international anti-ISIS coalition. Meanwhile, the Assad regime maintains an uneasy balance with YPG forces in Hasakah Province, particularly in the cities of Hasakah and Qamishli, and remains unwilling to allow a Kurdish separation from Syria. Similarly, Syrian Kurds harbor no sympathy for the Assad regime following years of systemic repression and the removal of the remaining regime presence in Hasakah Province forms a necessary precondition for the formation of a truly autonomous Rojava, Although regime and YPG forces continue to informally cooperate in Hasakah Province, this engrained antipathy has resulted in numerous minor clashes between regime and YPG forces in northeastern Syria. In one recent incident, YPG forces refused to provide support to regime forces during an early June 2015 ISIS offensive against regime positions south of Hasakah City, prompting the state-owned Al-Watan newspaper to publish a critique of the “American project” to establish an independent Kurdish entity. One day after the fall of Tel Abyad, YPG and regime forces engaged in clashes throughout Qamishli which the YPG blamed on regime “provocations”. These tensions will likely intensify as the YPG continues to gain ground in northern Syria and the regime suffers additional losses in western Syria. The YPG and its local allies retain an optimal position to threaten ISIS control over ar-Raqqa City and its surrounding countryside in the aftermath of the battle for Tel Abyad. Rebel fighters in the Euphrates Volcano Operations Room have identified ar-Raqqa City as their next objective and the YPG defense chief for Kobani canton confirmed that “Tel Abyad is only the end of a phase…we will pursue what remains of ISIS, no matter where.” ISIS appears to view a joint YPG-rebel advance on ar-Raqqa as a viable threat and reportedly directed residents of the city to stockpile food supplies in preparation for a potential siege. Any such offensive would require an attack by YPG and Euphrates Volcano fighters against the ISIS-held town of Ayn Issa and its associated Brigade 93 base, located south of Tel Abyad along the highway to ar-Raqqa City. However, the extent to which the YPG remains willing to advance outside of the Kurdish-majority regions of its envisioned Rojava remains unclear and Syrian Kurds may alternatively prioritize efforts against remaining direct threats to their own borders, such as the enduring ISIS presence in Sarrin southwest of Kobani or the regime remnants in Hasakah Province. Nevertheless, the ascendance of the YPG and the position it maintains between Syrian rebels and the regime will continue to form a key factor in dictating the options available to the U.S.-led anti-ISIS coalition in Syria. 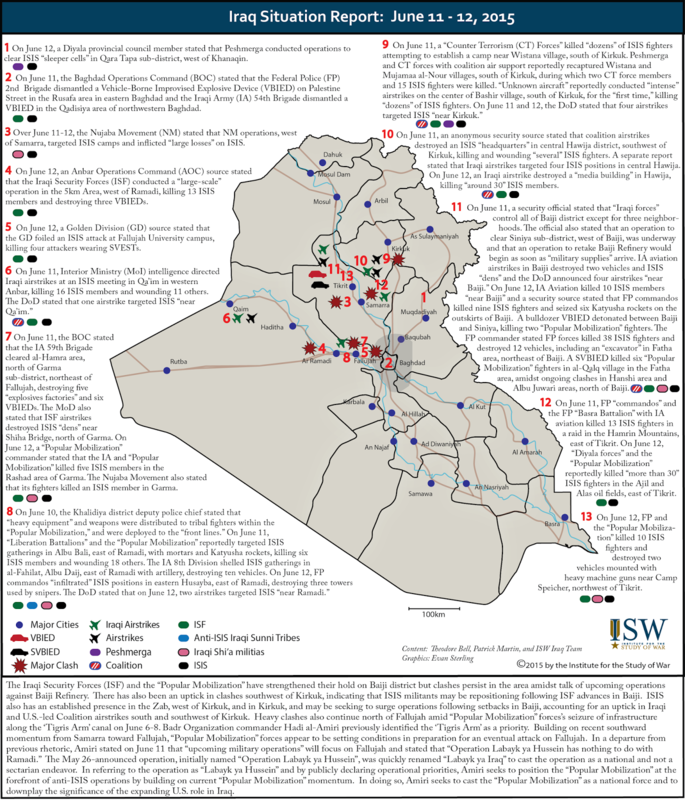 The purpose of this intelligence forecast is to outline ISW’s assessment of the courses of action available to Syrian actors and their principal benefactors over the next six months. 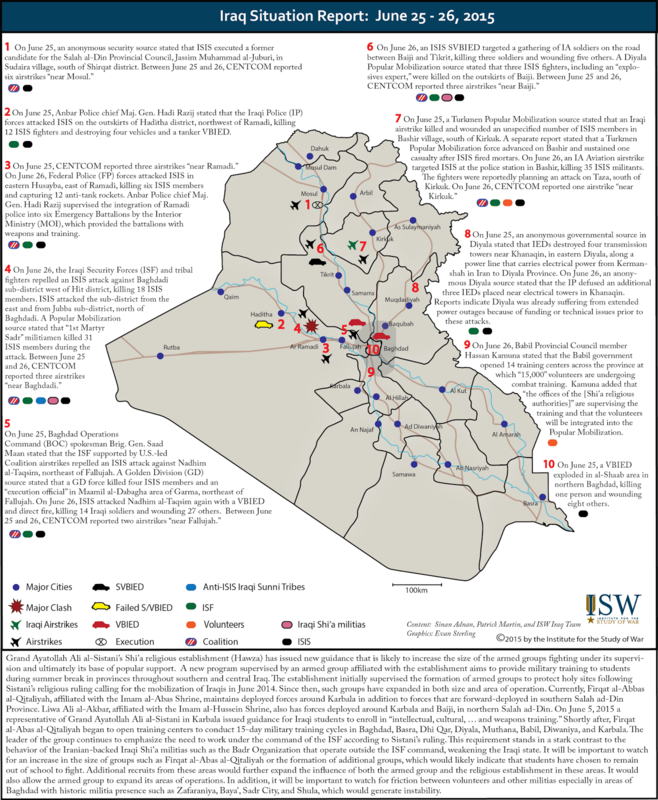 ISW assesses that the dynamic stalemate that has defined the Syrian civil war since 2013 may be broken in this timeframe. The expansion of ISIS’s maneuver campaign into Syria’s central corridor is one potential inflection that could change the course of the war by shattering the Assad regime’s area defense strategy in western Syria. Rebel groups and Jabhat al-Nusra are also positioned to escalate their offensives against the regime in southern and northern Syria, and their aggregate effect may force a contraction of the Syrian Arab Army in the mid-term. Alternately, the regime along with increasing Iranian support may alter its battlefield disposition to concentrate upon limited offensive operations against key rebel positions in pursuit of decisive effects, especially in Damascus. The range of actions that various actors in Syria may take generate a spectrum of possible outcomes for the Syrian war and its potential post-war environment, several of which are perilous to U.S. policy in the Middle East and current strategies to defeat ISIS in the coming year. 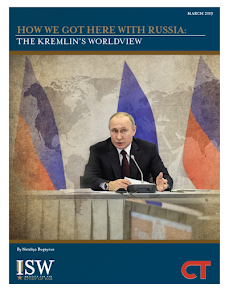 This assessment will forecast the most likely and most dangerous contingencies that may transpire in Syria in the second half of 2015 from a U.S. policy perspective.